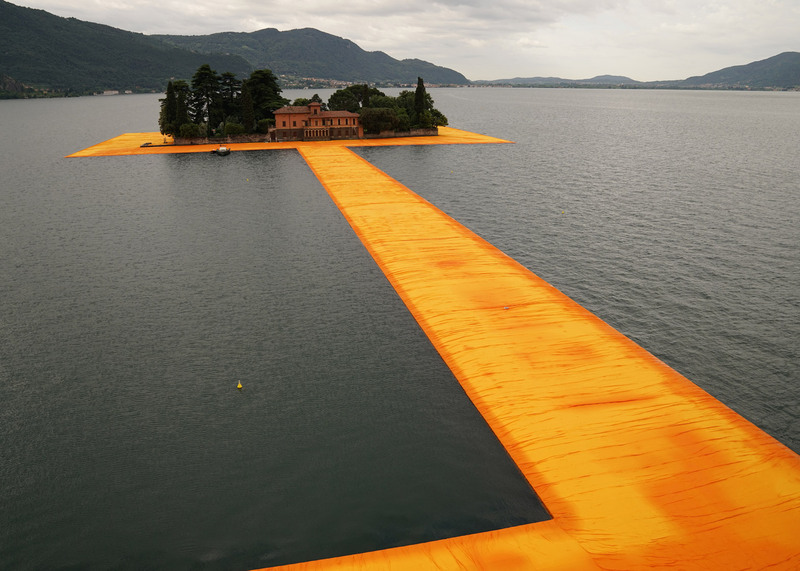 Three kilometres of saffron-coloured pathways temporarily connect the shore of Italy's Lake Iseo to islands at its centre in this installation by Bulgarian artist Christo (+ slideshow). 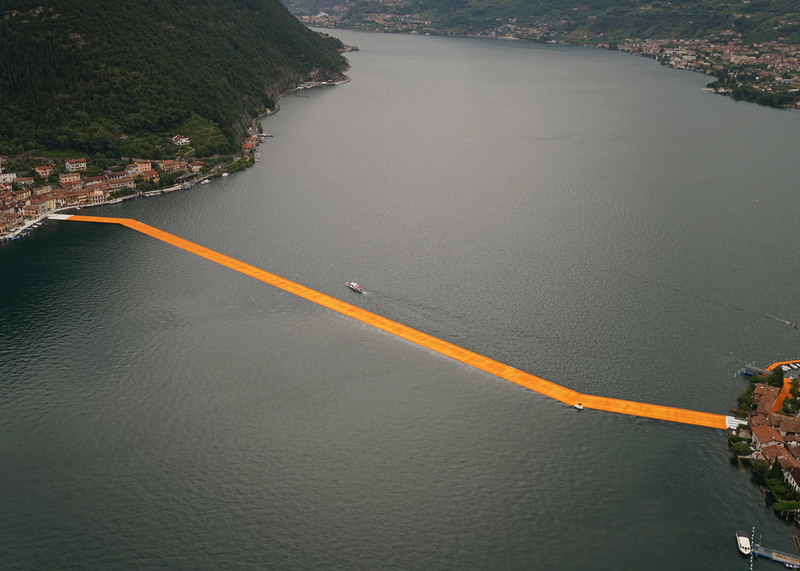 The Floating Piers will stretch across the lake for 16 days during June 2016. Visitors can walk from Sulzano on the lake's eastern edge to the island of Monte Isola. 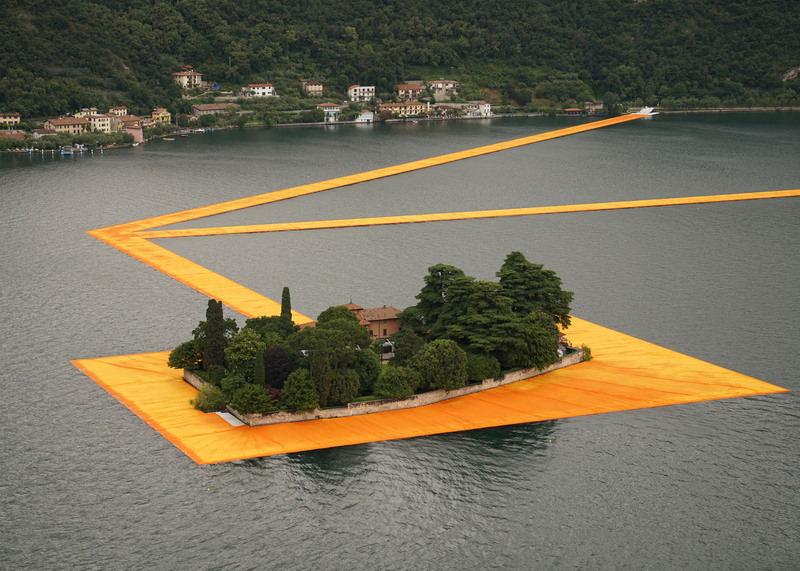 They can also use two paths to reach the islet of San Paolo, which is encircled by the pontoons. 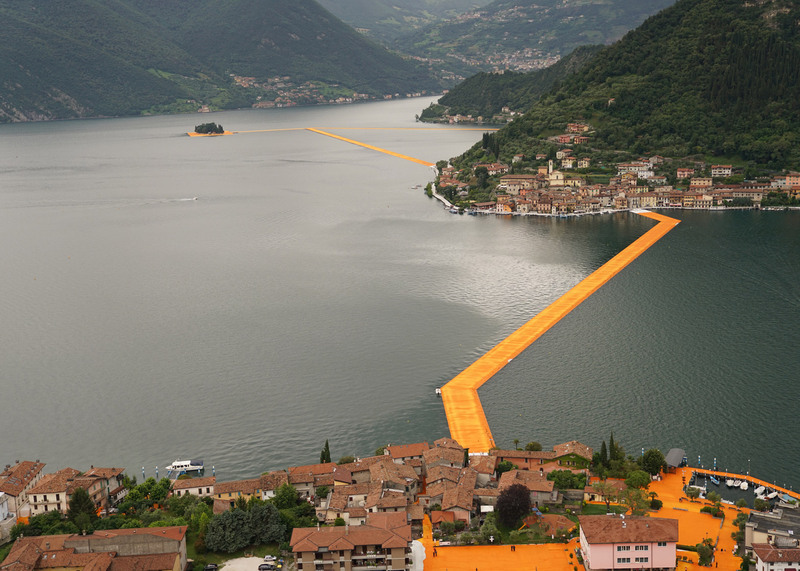 The shimmering orange-yellow fabric that is draped over the modules continues for an extra 1.5 kilometres along the streets of Sulzano and the village of Peschiera Maraglio on the other side. The piers measure 16 metres wide and rise approximately 50 centimetres above the water, with sides sloping gently down to the surface. A modular system of 200,000 high-density polyethylene cubes forms the walkways, which are designed to move up and down with the movement of the waves. 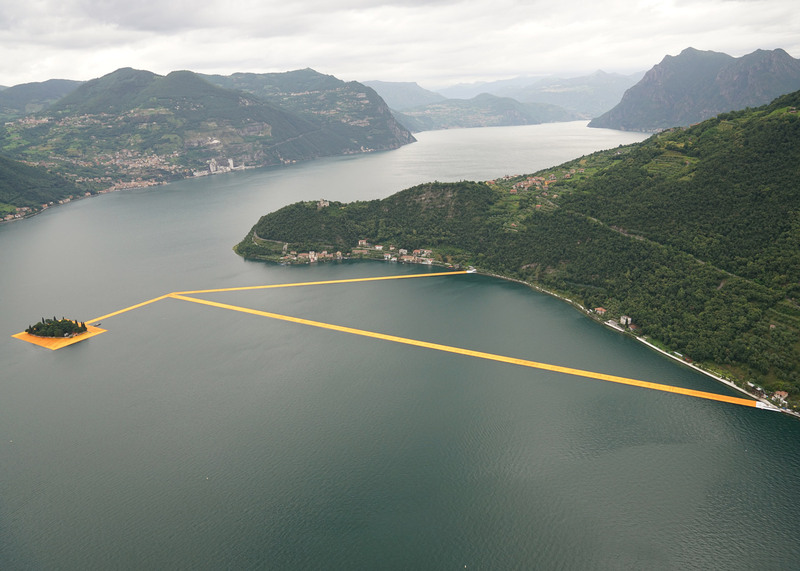 "The mountains surrounding the lake will offer a bird's-eye view of The Floating Piers, exposing unnoticed angles and altering perspectives," said Christo. 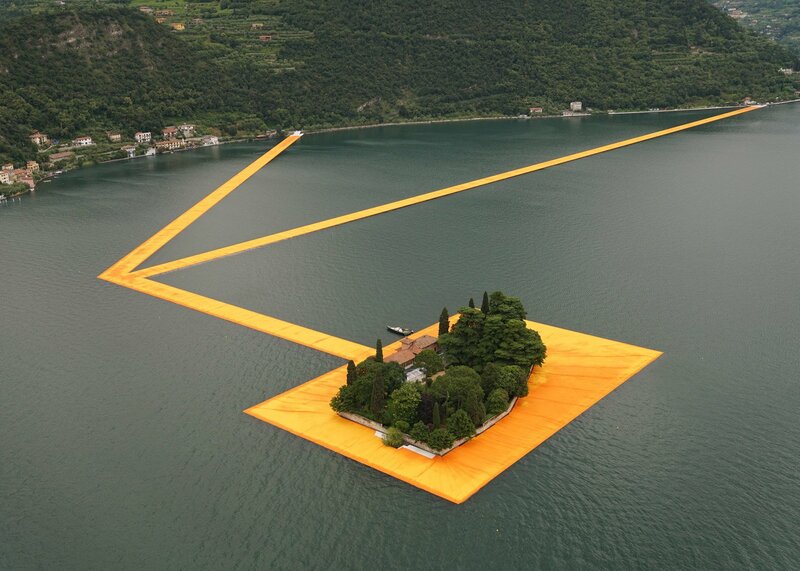 The 81-year-old artist – whose full name is Christo Vladimirov Javacheff – is renowned for the large-scale fabric installations he created with wife, French artist Jeanne-Claude, who died in 2009. Together they wrapped Berlin's Reichstag building in material, and strung 39 kilometres of fabric between giant posts across California. Their last large-scale project was The Gates – 7,503 nylon gates installed around New York's Central Park in 2005. 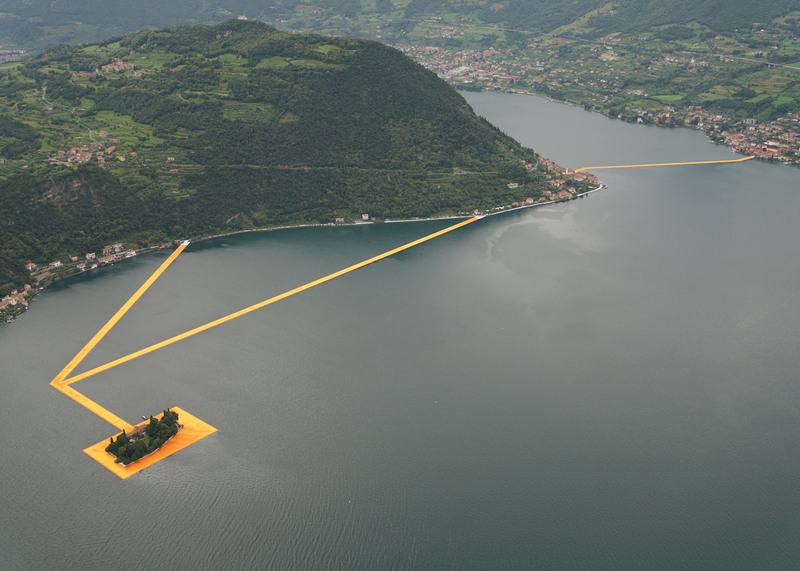 The Floating Piers was conceived in the spring of 2014, when the artist and his production team scouted the lakes of Northern Italy for a location. They settled on Lake Iseo, positioned at the foot of the Italian Alps, 100 kilometres east of Milan and 200 kilometres west of Venice. 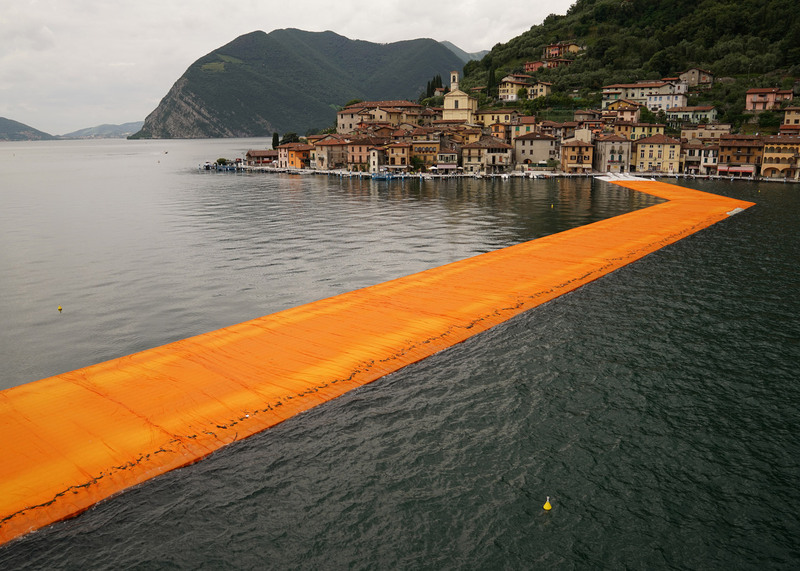 The project is funded entirely by the sale of Christo's original works of art. After the 16-day run, all of the components will be removed and industrially recycled.